In conjunction with the team at Advera Health, we settled on the TNF alpha inhibitors for our study. This class of medication is prescribed for rheumatoid arthritis, psoriatic arthritis, Crohn’s disease, and ulcerative colitis. It includes widely prescribed medications including Humira (adalimumab), Enbrel (etanercept), Cimzia (certolizumab pegol), Remicade (infliximab), Simponi (golimumab), and Simponi Aria (golimumab). Using this class of drugs for this study provided us with robust data in both FAERS and our claims database. We had three main goals with this study: i) to examine the downstream medical costs associated with infections linked to the use of TNF alpha inhibitors; ii) to determine if Advera’s Evidex platform validated a hypothesis that the incidence pneumonia as an adverse event in FAERS would be similar to the incidence rate of pneumonia as an adverse event in the WEA Trust medical claims database, and iii) whether that higher incidence of pneumonia caused by certain TNF alpha inhibitors would result in higher downstream medical costs. We examined a data extract of all medical and pharmacy claims at WEA Trust for the period August 1, 2013 through July 31, 2015. Current Procedural Terminology (CPT) Service Codes were used to establish three areas of downstream cost measurement: emergency room visits, hospitalizations and ambulance transportation. Only medical services incurred after filed pharmacy claims were examined. ICD-9 diagnoses were included in all medical claims and were used to match to listed adverse events in FAERS for each drug. What we found in the WEA Trust claims data was that Cimzia showed to have a statistically significant adverse event incidence rate of 13.6% for pneumonia, whereas Simponi had an adverse event incidence of 40%, as compared to Humira and Enbrel which each had an adverse event incidence rate of 0.5%. The final analysis demonstrated that Cimzia and Simponi were associated with a higher incidence of pneumonia adverse drug events as compared to other TNF’s (Humira, Enbrel, and Remicade). On the costing side, we used the WEA Trust claims data to calculate the downstream medical costs over the entire course of the study period. The downstream costs due to emergency room visits were on average $522 per dispense for Cimzia as compared to $256 for Humira and $190 for Enbrel. The downstream medical costs per dispense due to hospitalizations were $156, $79, and $57 and due to ambulance transportation were $30, $19, and $19 for Cimzia, Humira, and Enbrel, respectively. These findings correlate well with the downstream costs calculations from Advera which estimates Cimzia having the highest downstream costs ($86 per dispense) with Humira ($66) and Enbrel ($59) having lower downstream costs. Advera also showed an elevated rate of pneumonia for Cimzia (912 cases, ROR 2.39, 95% CI 2.23 - 2.55), compared with Humira (5,200 cases, ROR: 0.96, 95% CI 0.93 - 0.99) and Enbrel (5,860 cases, ROR: 0.93, 95% CI 0.91 - 0.96). 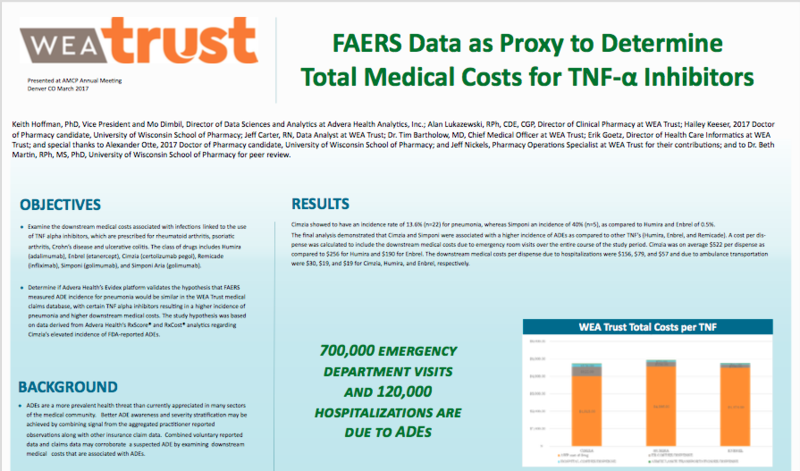 Based on these findings, we conclude that FAERS data can be used as a proxy to determine adverse event outcomes in an insured population, thereby assisting in lowering costs and improving outcomes through the prevention of adverse events. This is a vital deduction because the study of these matters from claims databases are notoriously expensive, laborious, and time consuming. Conducting similar reviews via Advera Health’s Evidex platform using FAERS data can be done instantly and across multiple indications at once. cause infections and result in higher medical costs, WEA Trust will be working with providers to move members away from these TNF inhibitors in order to provide a safer health benefit at a lower cost. We’re very proud that our work has resulted in an abstract and poster presentation at this week’s Academy of Managed Care Pharmacy (AMCP) conference in Denver, CO on our methodology and findings. Written by Alan Lukazewski, RPh – Director of Clinical Pharmacy at WEA Trust.